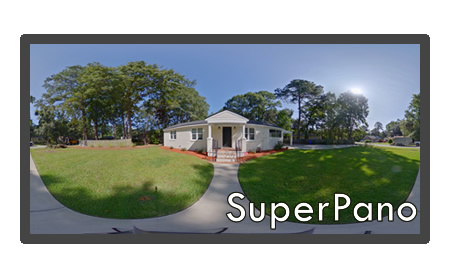 If you would like to show it ALL, you will LOVE the SuperPano. It provides all the clarity of the Pano tour AND allows for Full 360x180 exposure! Seemless full-view scenes will really maximize your listing's potential by showing every detail in sharp focus and balanced lighting. Imagine seeing every inch of of a room, big or small! This tour will really sell your listing and your clients will be thrilled! Tour includes as many stills and scenes as is necessary to show off the entire house & yard, all without any additional "per scene", "per shot", or "per square foot" charges. Click here for a sample.